Ask any tabletop game enthusiast and they’ll tell you: mathematics and probability systems are not limited to digital games. Tabletop games thrive on mathematics, and live-action games depend on them to define many of their gameplay interactions. Outbreak‘s design, in particular, is littered with probability theory from its core systems to its specific mission content, and here I’ll be discussing one of the most central (and controversial) probability-driven mechanics. Outbreak is a week-long game of zombie tag. One team (the Zombies) attempts to tag another team (the Survivors) which may use Nerf guns to defend themselves. As Survivors are killed, they join the Zombies until eventually all players are Zombies or, in some rare cases, the Survivors escape. 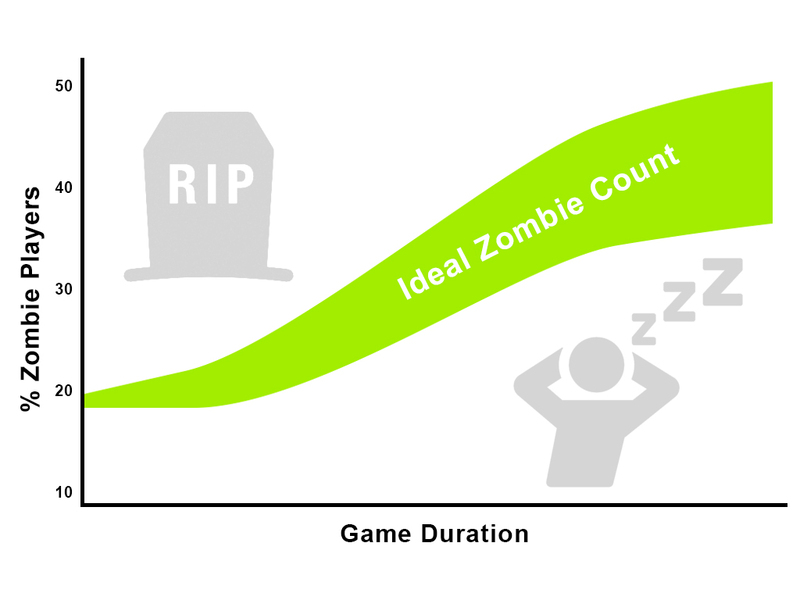 Now, this growth is entirely dependent on the performance, habits, and participation levels of the players, but when this “Ideal Zombie Count” channel is maintained, it delivers an increasing amplitude of what makes each team satisfying to play: the Survivors have a growing sense of difficulty and challenge, while the Zombies gain a sense of slow empowerment and brotherhood as their numbers increase. 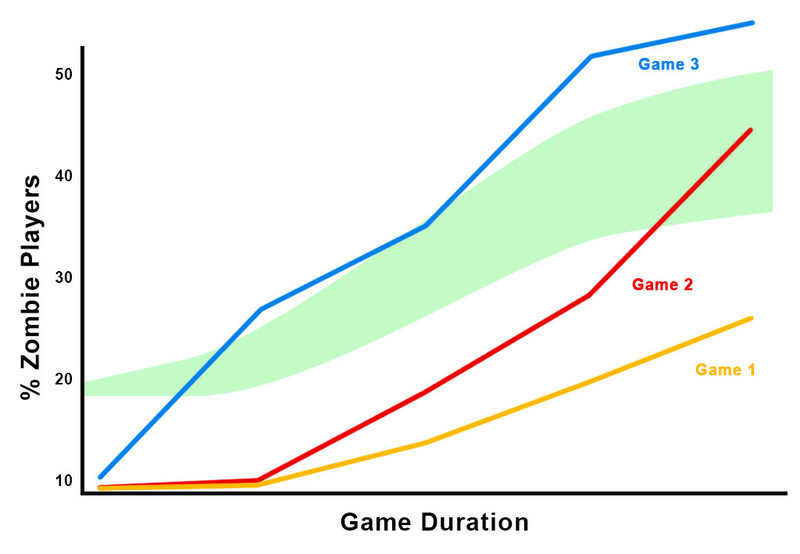 As you can see, none of the games we played consistently fit the desired curve. As a matter of fact, one of the games never even got close to the goal! With three games played and none of them hitting the “ideal” channel, it seems obvious what problem we needed to solve. Imagine you had a 100-sided die, and the goal was to roll a 50. 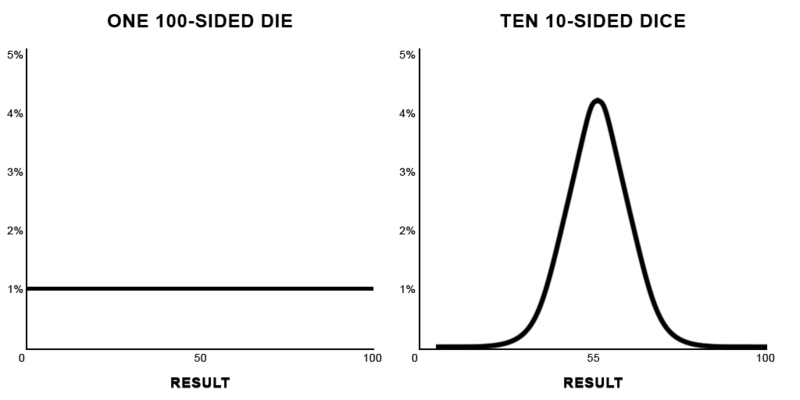 By repeatedly rolling the die, we know due to the law of averages that the mean result will be around 50. But what if you only had one roll? What could possibly be done to improve the likelihood of getting close to the desired result? 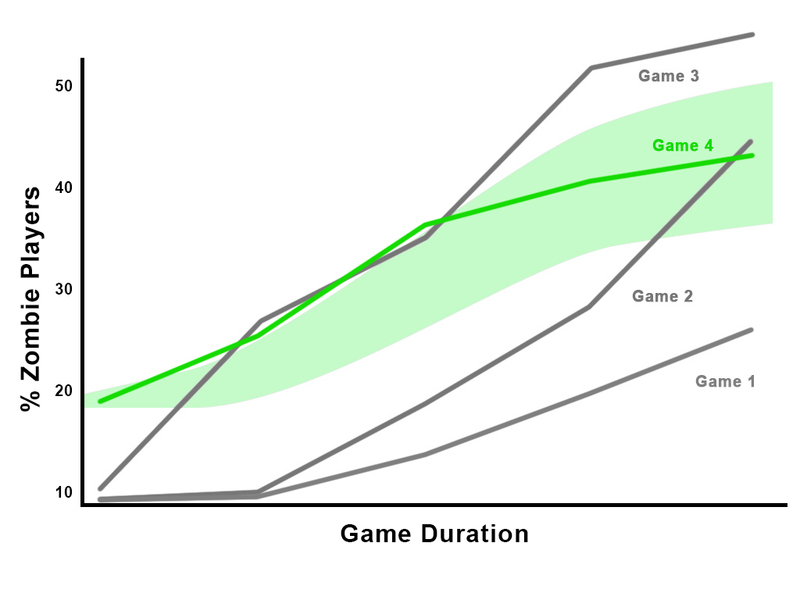 This is effectively how our game had been run: For the first three productions, one or two “Original Zombies” began the game with a strong mechanical boost to help propagate the Zombie numbers in the early stages of play. As developers, there were limited opportunities for predicting the effectiveness of these players since player-specific traits such as physical ability, participation, and cunning were so influential in performance. Within these rules, even one player possesses the ability to change the tide of the entire game in a very short period of time. Allowing Zombies to “revert” back into Survivors if they achieve a kill – This is particularly helpful in ensuring that the team ratios don’t change too drastically too fast, and gives the players the power of self-autobalancing. A very important rule of systems design is that systems choices cannot be made in a vacuum. These changes may look good on paper, but how do they impact the experience? Reversion was a systems-oriented mechanic that helped us (and our players) have more control over the team balance in the game, but also reduced the permanence of player interactions. Players of previous games would share stories of how they barely escaped death, or how they managed to kill the Survivors’ Leader through carefully orchestrated diversions. These conversations are much rarer with the reversion mechanic in place, which begs the question: Was it a good idea for Outbreak? Like all features, we should look at it from the perspective of what problems it solves: It helps create predictability and encourages more frequent play from Survivors (who would otherwise be hiding in self-preservation), but noticeably drains Zombie morale, and reduces drama and tension. Knowing which solution is more desirable is very contingent upon the player community and their ever-evolving preference. One thing is for certain, however: by looking at the mathematics and probability behind Outbreak, we’ve created more effective tools for solving a wider variety of problems, and whenever the tides of player preference change, we’ll be ready to address them effectively.